Transformers Masterpiece Skywarp MP-11SW. The figure is used. 100% Complete. 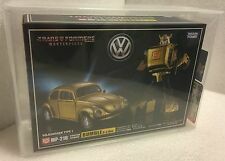 Authentic Takara. The figure and accessories are in like new and minty condition. The box is nice, but it has a crease in the center of the upper flap, as pictured. 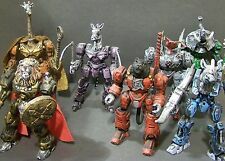 Displayed in robot mode by an adult collector. Please review the pictures carefully, the item you see is the item you get. The figure will be packed very carefully, and the package will ship with tracking and delivery confirmation. If you have any questions please feel free to ask. Thanks for looking and happy shopping!! Complete with weapon and accessories. This item is factory sealed in decent condition box. Dinged corner(s) and minor creasing will be present. No collector's grade box available. Mint in sealed box. This is not a ko. Transforms from robot mode to car mode to flying mode (includes “in flight” display stand). Sticker Sheet w. G1 & G2 Autobot insignia. Condition: NEW. TFSource Item ID: 9728. Product Details. Box Condition : GOOD CONDITION & NEVER OPENED ! 100% official product, not a knock-off or reproduction! AFA Grade: U9.0 Uncirculated. The AFA Case is in new condition. Still wrapped in plastic from the AFA. AFA Grading Style: Clear View - Modern Scale. The combination of voice and sound pattern is more than 200! He is factory sealed in the box. Signature Confirmation will be required. Item is brand new in unopened box. I also combine shipping and I ship internationally. However, the bottom side of the box is double taped. It was done by either manufacturers or BAPE employees. The upper side is single taped. MP-10R CONVOY (BAPE REDCAMO ver.). And my partner bought them at a very high price. 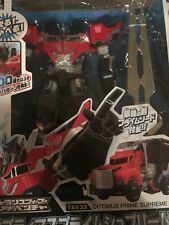 Transformers Titans Return Magnus Prime Super Ginrai from Siege on Cybertron . Condition is Used. Comes complete no instructions. He is dusty from being displayed only. Surfaces & Shelf Wear No shelf wear.C8. This was a 2015 Tokyo Toy Show exclusive. Tokyo Toy Show Exclusive. Features Voice and lights. Alternate paint application. 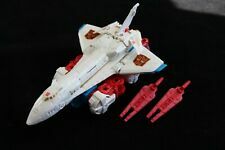 Includes: Silverbolt, Slingshot, Firefly, Air Raid and Skydive! We Are Your Source for Collectible Toys! Product Details. Never opened please buy no returns no refunds thank you! This highly sought after repaint of MP-11 Coronation Starscream brings the popular seeker Skywarp himself to the Takara Tomy lineup! This is the Asian market release of this product, and highly limited in its release. Buying Collections. Have a collection to sell? Simply email me only takes a minute. No collection is too big. Condition: Sealed. Comes as shown.